Unfortunately most people wait until physical illness occurs before seeking help from medical practitioners. However the western medical model only treats the symptoms, not the causes. “Some day the medical profession will wake up and realise that unresolved emotional issues are the main cause of 85% of all illnesses” (Eric Robbins MD). During the past ten years there has been a great deal of research showing how the mind and body respond to each other, demonstrating that emotional and psychological states translate into altered responses in the chemical balance of the body, particularly in the immune system. The emerging field of Psychoneuroimmunology (PNI) holds great promise in many ways, as it explains the connection between the mind and the immune system, incorporating methods to use the body’s inherent healing abilities. A diagnosis is nothing more than an inventory of how a person is functioning at present. Health is the ability to live to your full potential, and is a state of balance on seven levels: psychological, expression, connection, vocational, emotional, physical and spiritual. Every chronic disease is a manifestation of unresolved or incomplete healing. Chemical, physical and psychological irritations create functional imbalances in your body, which, if not corrected, will lead to disease. The first step to successful treatment is finding the true cause of the imbalance and then finding the least invasive therapy that can help your body to restore balance and health. Most of our emotional problems are caused by unresolved negative experiences or events in our lives that continue to impact us at an unconscious level. As you resolve the emotional ‘baggage’ you are carrying, you will have less internal conflict for your system to deal with. Profound physical healings can occur as you maintain more balance in the body’s energy system. 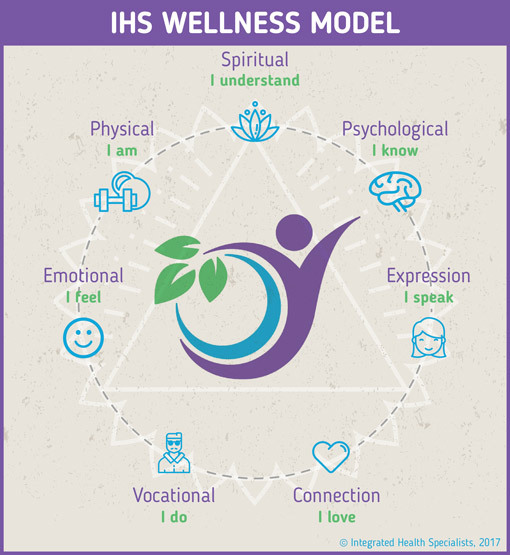 Applying the term “holistic” to concepts of well-being means that achieving and maintaining good health involves much more than just taking care of all the various components that make up the physical body. When the concepts of holistic health are put into practice, the approach to therapy takes on a new dimension. We see traditional medical care expanded to encompass a broad spectrum of therapies coordinated to meet that totality of a particular individual. The focus then is not just on the dis-ease but the whole person. With a holistic perspective, there are no artificially imposed limits on how deeply the client is perceived. The holistic therapist is as comfortable focusing on the spirit as on behaviour, thoughts, and feelings. A holistic therapist also sees both problems and their potential solutions residing within the person; she or he sees treatment a matter of tapping into those answers within rather than imposing resolutions from without. The role of the client changes in learning how choices, actions and attitudes affect their present condition, and how one can be an active participant in the healing process. The ideal of holistic well-being is the realisation of our human potential as total beings, and our desire to live fulfilling and satisfying lives. The goal is not just to be “well” in the physical body, but also to be in harmony with our environment and ourselves at all levels, body, mind and spirit. Also diet, exercise, lifestyle, social responsibility and relationships are taken into consideration when creating the optimum well-being. Various techniques are used in order to assist the client in understanding and developing their “self-healing” potential. The first of which is self-awareness. Once aware, the client can then access parts of themselves that are residing in the unconscious. By shining a light on these parts, the person is then able to transform them and to ultimately integrate them. Other key tools are willingness, persistence, courage and action. These, amongst many others, are essential for change and transformation to occur. A consistent movement toward becoming a whole and integrated person is the desired outcome. Our society is fast-paced, we want quick fixes and the pharmaceutical industry caters to this. Research and development money holds an antagonist treatment philosophy suited to the deficit problem definition model. This philosophy contends that the sick human being does not have the resources to overcome the problem and the extra help of medications and medical treatment are necessary to “fight” the disease process. When it comes to strep infections, this may very well be true, but in the world of mental and emotional issues, it actually slows down improvement. The medical-model therapist, playing the expert, knows where the psychological deficit lies and wishes to attack and dismantle the resulting dysfunctional behaviour. The holistic professional believes that people have the resources to overcome problems and illness and would rather work with those healing processes and enhance them. The course of healing always originates with the client, not the therapist. The art and skill of the therapist is to piece together, from the ordinary things the clients says, what that client believes will be helpful to healing. Working from within the client’s own values, opinions, and beliefs means that as the perceptive therapist notices and points out possible barriers to healing, clients will themselves want to knock them down or climb over them, instead of resisting them. It is the therapist’s job to aid progress toward client goals without the authoritarian imposition of the therapist’s worldview on the client.